This beautiful line-back is in her prime. She is out of our WF Commando bull (sire of Rebel HR) crossed with one of my all-time favorite cows, Turning Gun Gal. She is HCR and McGill breeding on top with Senator & Gunman on the bottom. 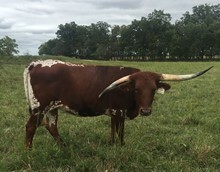 We have three of her calves (2 females and 1 bull) retained in our herd.